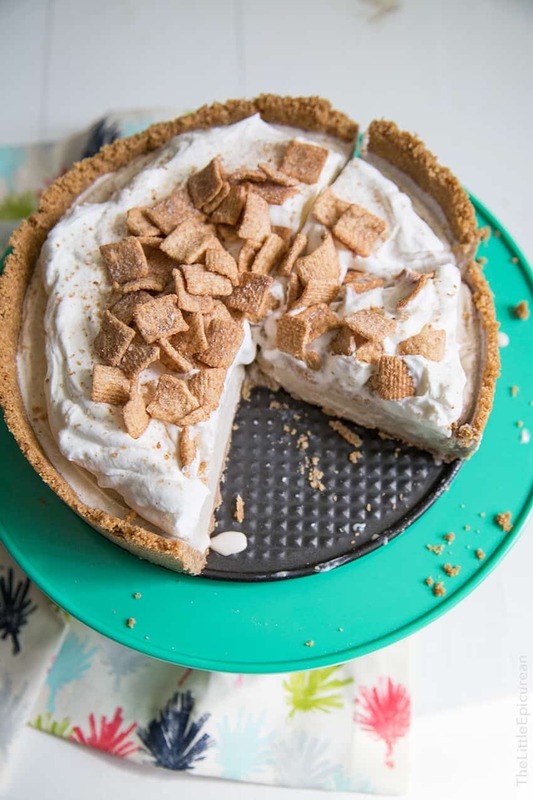 Cinnamon Toast Crunch Ice Cream Pie! 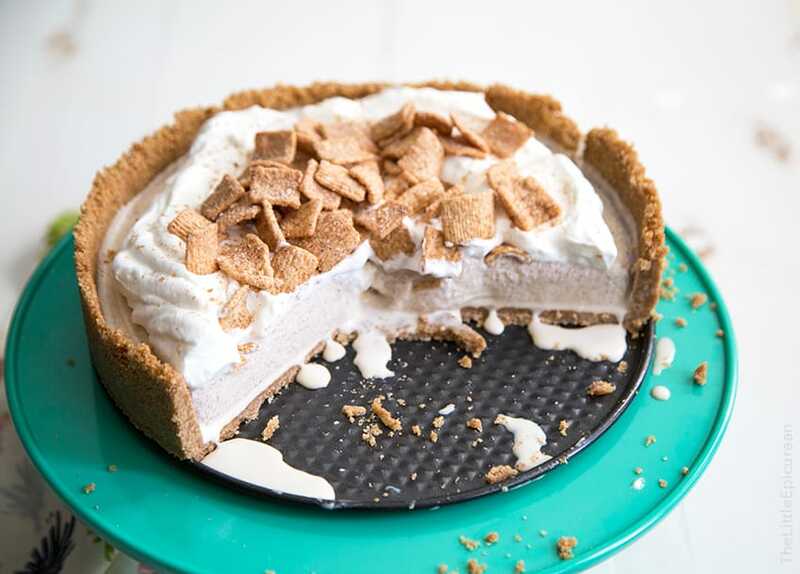 My favorite childhood breakfast cereal turned into an ice cream pie. 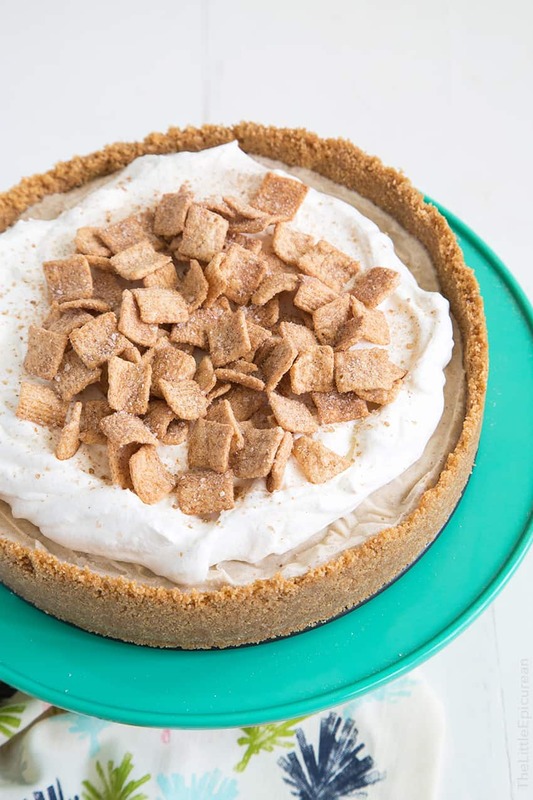 The cinnamon graham crust is filled with cinnamon cereal ice cream and topped with whipped cream. It’s the ultimate treat for Cinnamon Toast Crunch fans. This is the kind of dessert my childhood self dreamed of. My current self turned that dream into a reality. Cinnamon Toast Crunch was and still is my favorite breakfast cereal. The best part of eating CTC was the sweet cinnamon milk that was leftover once you ate all the cereal. Inspired by Momofuku Milk Bar’s cereal milk soft serve, I took my favorite sugary cereal and turned it into an ice cream. 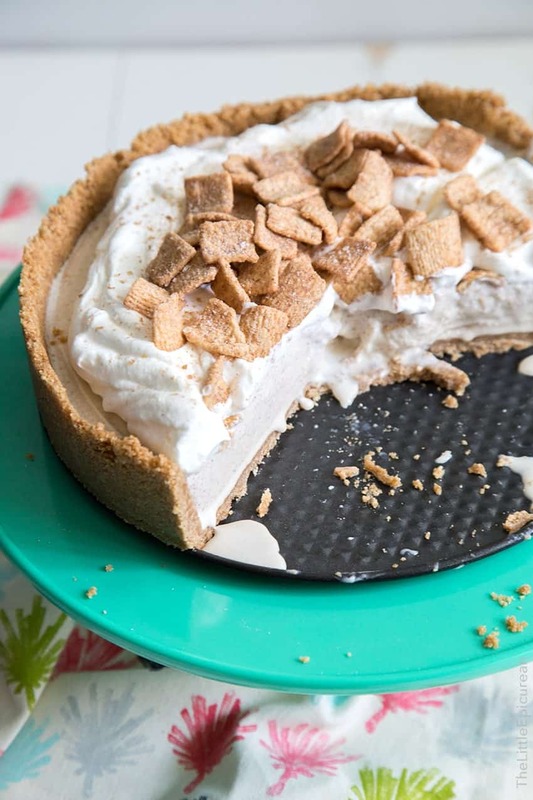 This cinnamon toast crunch ice cream pie is everything my dad would have ever wanted in a dessert. Out of all the sweets I’ve ever made, I think this would have been his favorite one. I have lots of fond memories eating CTC with my dad. He introduced me to this cereal and it will always remind me of him. No one else in our family loved cinnamon sugar they way we did. Whether it was a Cinnabon at the mall’s food court or a churro at Disneyland, the two of us would follow that intoxicating aroma anywhere. Growing up, I ate CTC all the time. But nowadays, it’s a treat I occasionally splurge in. This is the first box of CTC I’ve bought in four years. FOUR YEARS. The first bite was like a blast from the past. It’s just as perfect as I remember. I enjoyed a giant bowl with milk while watching Saturday morning Jack Hannah’s Wild Countdown reruns. Even if only for a moment, it felt wonderful to feel like a child again. I love all things ice cream. With summer on the way, I expect to make gallons and gallons of ice cream. This was my first time making ice cream pie and definitely not my last. 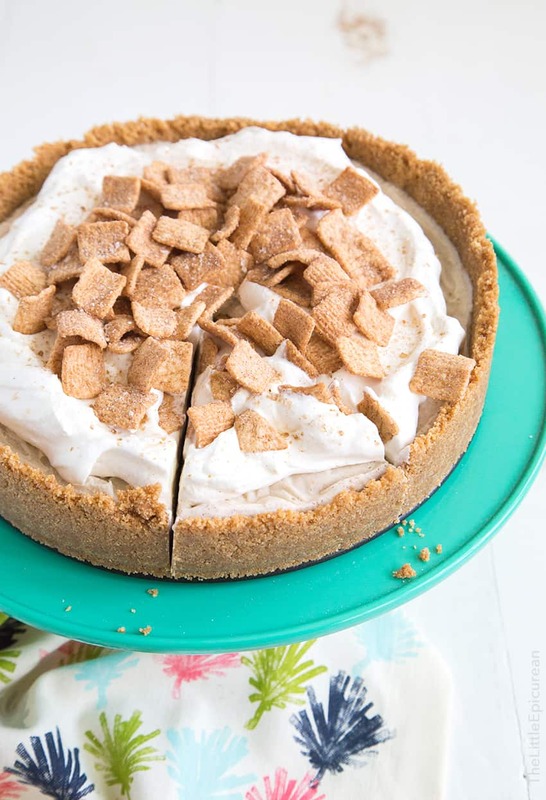 The no-bake crust is made from a mixture of crushed graham crackers and CTC tossed with a little melted butter. The cinnamon ice cream is made with CTC cereal milk. That means I soaked the cereal in milk and cream until the liquid was infused with the cinnamon-sugary goodness. After that, I simply used the cereal milk mixture to make a regular ice cream base with egg yolks and sugar. 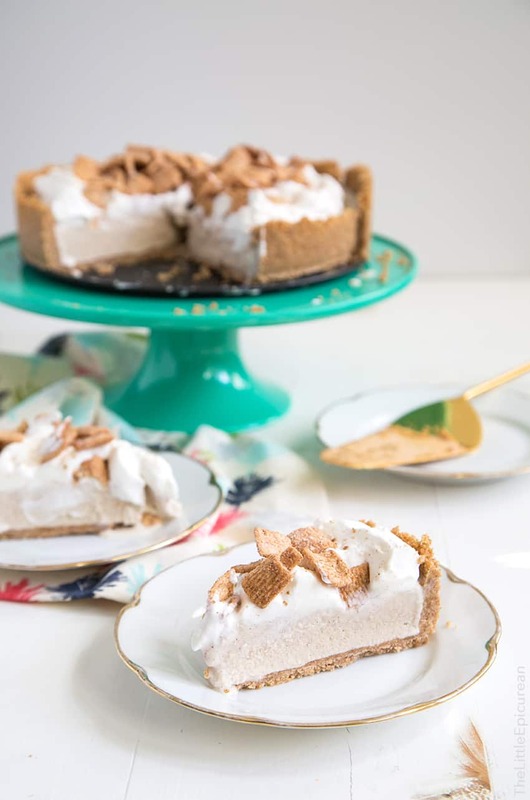 I can’t believe I didn’t make this ice cream pie sooner. All those childhood years I missed out on this awesome dessert. Now that I know better, I might as well try making cereal ice cream treats with all my childhood favorites. My dad would have definitely been proud. Place graham crackers and cinnamon cereal in a food processor. Pulse until mixture is ground. Transfer to a large bowl. Stir in ground cinnamon. Add melted butter and mix together using a spatula. Press mixture into the bottom and up the sides of a 10-inch springform pan. Use the bottom of a muddle or a drinking glass to ensure the crust is compact. Cover with plastic wrap and let chill in the fridge or freezer until ready to use. 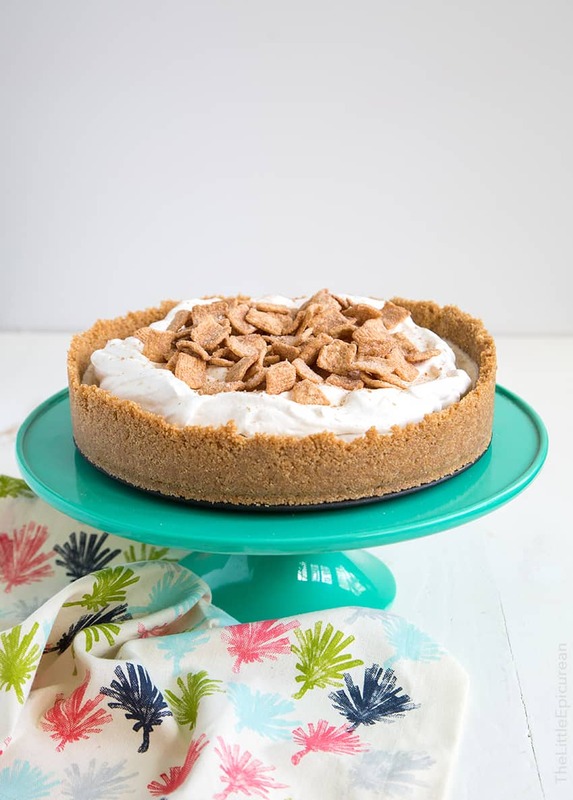 In a medium pot, stir together milk, cream, and cinnamon cereal. Let sit at room temperature for 20 minutes. Strain and discard cereal. The cereal will absorb some of the liquids. Measure liquid. Add enough cream until mixture is a total of 3 cups. Add 1 tablespoon sugar to pot and bring to simmer. Meanwhile, in a large bowl whisk remaining sugar, cinnamon, and yolks. Once milk mixture begins to simmer, lower heat. Temper hot milk into sugar-yolk mixture. Slowly add hot milk into yolks about 1/4 cup a time, whisking to distribute heat. Once all the milk has been added to yolks, transfer everything back into the pot. Stir over medium-low heat until mixture reaches nappe consistency, or 180 degrees F on a kitchen thermometer. Let mixture sit at 180-185 degrees F for 3 minutes to pasteurize egg yolks. Remove from heat. Transfer to an airtight container and let mixture mature in the fridge overnight, or for at least 4 hours. Freeze mixture in ice cream maker according to your unit's instructions. Once the volume has increased by half and has reached a soft serve consistency, turn off ice cream maker. 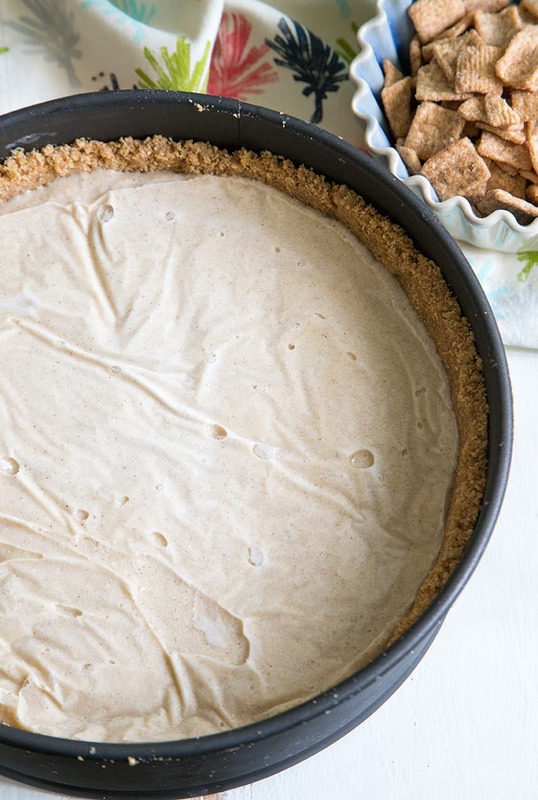 Pour cinnamon ice cream into prepared pie crust. Cover with plastic wrap and freeze for at least 5 hours. Before serving, top cinnamon ice cream with whipped cream. Add cinnamon cereal to garnish. Serve immediately. 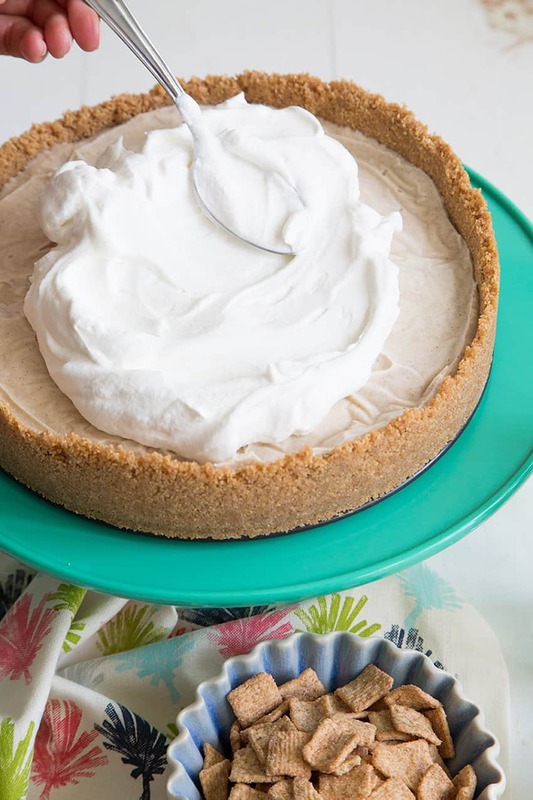 Whipped Cream: Whip 1 cup chilled heavy cream and 2 tablespoons sifted powdered sugar to medium peaks. Spread over assembled ice cream tart.